Everything from the way you use banking apps to the speed of your Netflix stream could soon be changing, if all goes to plan for the Federal Communications Commission. The FCC's mission — essentially gutting the internet as we know it — would allow service providers to create so-called fast and slow lanes for subscribers. Commission Chairman Ajit Pai, a Republican, announced on Tuesday a plan to put an end to what he called the federal government's "micromanaging" of the internet. Details of the proposal will be released on Wednesday, three weeks before it will be put to a vote by the FCC on Dec. 14. In short, net neutrality rules treat the internet like a utility, helping to control what consumers are charged and ensuring there is no paid prioritization — where internet service providers would be free to create so-called fast and slow lanes, allowing them to choose whether to block or slow certain websites and to charge more for better quality. "Under my proposal, the federal government will stop micromanaging the internet," Pai said in a statement. "Instead, the FCC would simply require internet service providers to be transparent about their practices so that consumers can buy the service plan that’s best for them and entrepreneurs and other small businesses can have the technical information they need to innovate." Pai, who voted against the net neutrality rules in 2015 as a commissioner, has long been an advocate for the "light touch" approach that was previously in place. "Nothing about the internet was broken in 2015," Pai said in August, speaking of when the FCC moved to regulate the internet as a public utility under Title II of the Telecommunications Act. "It was all about politics." The FCC encouraged consumer feedback on how to proceed — and collected a record 22 million responses before the comment period closed at the end of August. However, in a call with reporters on Tuesday, senior FCC officials said they did not take into account the quantity of the comments when making their decision. Some of the comments were form letters, entered by the same person multiple times and made with fake email addresses, an official said. Under the new proposal, which will be released on Wednesday, internet service providers would have to disclose if they engage in throttling — that's slowing down a site — or blocking or other forms of paid prioritization. That disclosure could be made on their website or through the FCC. 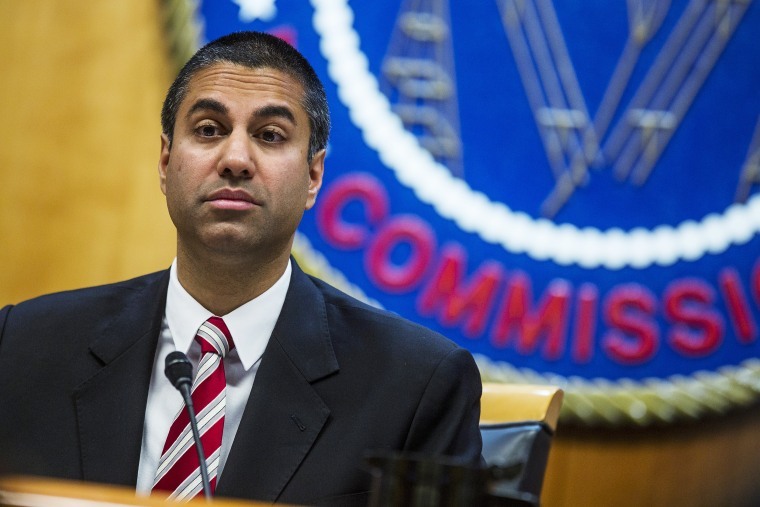 Pai has said heavy-handed net neutrality rules have led to reduced investment and the axing of 75,000 to 100,000 jobs, such as laying cable and digging trenches to help bring high-speed internet access to rural and low-income areas. It was a point senior officials echoed on Tuesday, noting that according to their review, Title II rules resulted in decreased broadband investment and decreasing innovation by delaying new features or not offering them at all. “I look forward to returning to the light-touch, market-based framework that unleashed the digital revolution and benefited consumers here and around the world," Pai said in a statement. If the rules are dismantled, it will mark a massive win for telecommunications giants, including AT&T, Verizon, and Comcast, the parent company of NBC News. The repeal could allow them to charge subscribers more money for access to certain sites and services. Dave Watson, president and CEO of Comcast Cable, wrote in a blog post that the company "does not and will not block, throttle, or discriminate against lawful content." "We will continue to make sure that our policies are clear for consumers and we will not change our commitment to these principles," he said. "That is how we run our internet business and it is a key part of our core network and business practices." Big technology companies like Apple, Google, and Amazon have been supporters of net neutrality rules. A Google spokesperson told NBC News the FCC's net neutrality rules "are working well for consumers and we're disappointed in the proposal announced today."